Includes 2 pieces of batteries. Can be used in flashlight and other electronic products. Cable:the red wire is "+",the black wire is "-", please keep the battery positive and negative are right, to ensure the normal use and charging. Do not disassemble,short circuit or dispose of in fire;Do not mix with different battery type. 150% new rechargeable battery first, and then re-use. New batteries are generally three to four times to go through the cycle of charge and discharge capacity to the highest value. In principle, be used in the order: full > run > full; (Note that rechargeable batteries can not overcharge and over discharge). Keep the battery clean and positive and negative, to ensure the normal use and charging. Rechargeable batteries are not afraid to use, but the fear of long-term (one year or longer) is not used. That because of the long-term self-discharge and cause the battery to be placed without electricity, resulting in passivation of the internal material, voltage as low as zero volts and can not restore its original capacity, or even unusable. Do not use old and new batteries or put together a different state of charge to use, not to capacity, type and brand used together different types of batteries and charging. Tell us what you think about PALIGHT BG Battery 10440 Rechargeable Li-ion Battery 1000mAh (2pcs), share your opinion with other people. 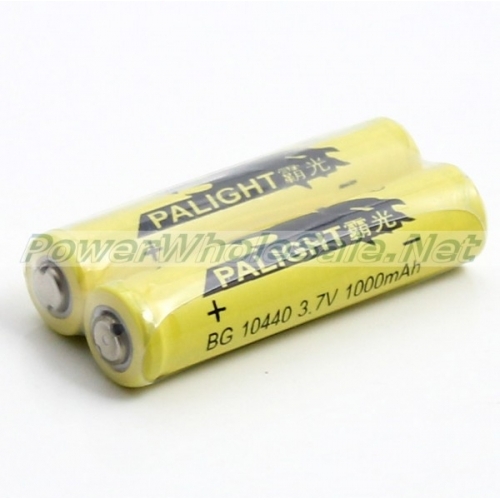 Please make sure that your review focus on PALIGHT BG Battery 10440 Rechargeable Li-ion Battery 1000mAh (2pcs). All the reviews are moderated and will be reviewed within two business days. Inappropriate reviews will not be posted.